French Clafoutis is a speciality from the Limousin region. It’s also one of my French Mother-in-law’s specialities and one of my husband’s favourite classic desserts. If we’re lucky enough to visit Antoine’s parents in Provence early summer, Madeleine proudly rustles up her baked dark cherry custard dessert with cherries freshly plucked from the orchard at the bottom of the garden. But after twenty years, I finally plucked up the courage to make this ridiculously easy pudding at home. Why did I wait so long to make it? Perhaps, I dare say, because it was a bit heavy – especially as I prefer lighter desserts. Could Belle Maman really discover I’d slightly changed her recipe? 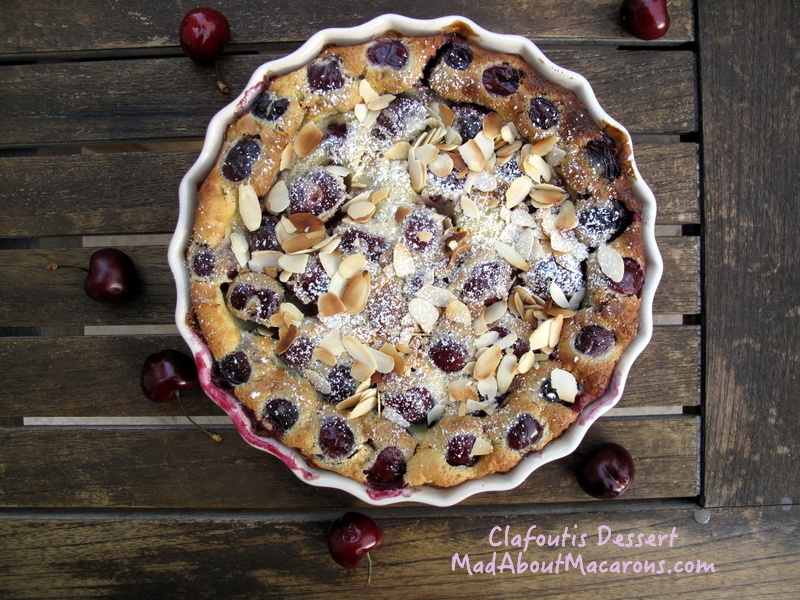 So many clafoutis recipes call for pitted cherries. Like it’s traditionally made in the Limousin, Madeleine normally throws in the whole cherries as they are and most of us politely dispose of the stones at the table. I say most of us, as Antoine – in his more natural Corsican style – rocks on the back of his chair, plotting his target as he catapults and projects them less than delicately into the garden – “Heh, je plante!”, he shrugs at us all. It’s his Corsican sense of humour of saying he’s planting cherry trees. Oh, pl-ease! I may mock but whole, unpitted cherries do keep in their flavour, and it’s far quicker than standing over the kitchen table with dark cherry-stained hands looking like Jack (or Jill) the Ripper. So just throw them in as they are naturally then get the family to do the gardening at the table. Otherwise pit them if you prefer, especially if you have a cherry stone extractor as part of your kitchen gadgetry. This almond-topped clafoutis has been tried, tested and approved by Antoine, Julie and Lucie. Just don’t tell his Mum. The almond topping idea is pinched from my friend, Véronique (merci!). You could replace the almond extract with a tablespoon of Kirsch or Amaretto liqueur for a more adult version. 1. Preheat the oven to 180°C/350°F (gas 4). Butter an ovenproof china or pyrex dish (22cm diameter and 5cm deep) large enough to hold the cherries in a single layer. Sprinkle in the sugar, shaking it all around so that it coats the surface of the dish and place the cherries in it. 2. Combine the flour, salt, baking powder and sugar in a large bowl. Add the eggs and yolk and, using a balloon whisk, mix well until the mixture is smooth. Continue whisking adding the milk, almond extract and melted butter. Pour over the cherries. 3. Bake for 35-40 minutes or until browned. Toast the flaked almonds in a non-stick frying pan for a few minutes on medium heat until they’re golden and sprinkle on the Clafoutis with a dusting of icing/confectioner’s sugar. Serve warm directly from the dish. Don’t forget to join me on Instagram (or Facebook), where I’m having fun posting shots from day to day around Paris – from the market, to chocolate and pastry walks, to views of Paris, to mad family life. Feeling daring? Why not try out these savoury asparagus French Clafoutis recipes as a summery supper dish?